1. The banana “tree” is not really a tree, but a giant herb. The banana is the fruit of this herb. 2. Bananas were introduced to the United States at the 1876 Philadelphia Centennial Celebration, where they were sold wrapped in foil for 10 cents each. 3. The average American consumes 28 pounds of bananas per year. 4. Research has proven that just two bananas provide enough energy for a strenuous 90-minute workout. 5. Bananas are available all year-round. They are harvested every day of the year. I recently attended a Dole Banana event where I learned lots of fun facts about Bananas. And when they were calling out some of these facts I was speedily typing them out to share with you guys. I couldn’t believe that an average American eats 28 pounds of bananas a year! Holy Crap! I consider myself to be the “average” American and I eat Bananas often, but not all the time. Jorge, on the other hand, eats bananas almost daily. He even eats them with spaghetti (seriously, on the same plate). I am trying to convince him to weigh each banana and keep track for a year…but for some reason he isn’t saying yes. This cake…oh this Banana Dream Cake…it is my favorite cake I have ever made. And I do not say that lightly. I first made it almost 2 years ago now and it has remained at the top of the list. Of course, back then, I was a new blogger and the only person reading this blog was my Mom. I also had no idea how to take a decent photograph (or make a layer cake), so the cake itself sure wasn’t very pretty. So when we were talking Bananas at the Dole event, I couldn’t help remembering this Banana Dream Cake. It stuck out in my mind and when I had two overripe bananas staring me in the face, I finally gave in. Heaven. Pure heaven. Do yourself a favor and make this. Make it tonight. Make it the next night too. Oh and while your at it, please overnight me a piece. Preheat oven to 275 degrees F (135 degrees C). Grease and flour 3 8-inch round cake pans. In a small bowl, mix mashed bananas with lemon juice, set aside. In a medium bowl, mix flour, baking soda and salt. Set aside. In a large bowl, cream 3/4 cup butter and 2 1/8 cups sugar until light and fluffy. Beat in the eggs one at a time, then stir in 2 teaspoons vanilla, sour cream and applesauce. Beat in the flour mixture alternately with the milk. Stir in banana mixture. For the frosting: In a large bowl, cream butter and cream cheese until smooth. Beat in vanilla. Add confectioners' sugar and beat on low speed until combined, then on high until frosting is smooth. Assemble the 3 layers with a thick layer of frosting in between each layer. Then apply a thin crumb coat on the top and sides. Pop back in the freezer to harden the crumb coat for about 10 minutes. Then apply a thick even layer around the outside of the cake. Sprinkle on a little cinnamon around the outside and store in the fridge until ready to serve. What interesting banana facts 🙂 Love the cake! It is absolutely gorgeous… Now, thanks to you, banana fana fo fana is playing in my head, and in a very strange voice! Gosh.. Thanks for sharing this beautiful cake! And cream cheese frosting too! Yummy! Oh I believe you because this cake looks incredible! And that frosting is magical and I could see me eating that with a spoon! What fun facts! I will have to share them with my boys because I know they will get a kick out of them. 🙂 This cake look wonderful! I’m not very experienced with layer cakes, but yours makes me want to give it a try. So pretty! This cake – oh yum. Love the addition of the sour cream – I’m sure it keeps and moist and gives it a little tang! Interesting facts on the bananas. For whatever reason, eating uncooked bananas gives me a huge stomach ache so I can really only have them in breads or cakes – oh well:-). I told my doctor about my banana problem at my last visit and he was like “well don’t eat bananas then.” That wasn’t the answer I was looking for – I want to eat them so badly because they are such a great, handy snack. I love triple layer cakes – this does look amazing. I am one of those people who eats a banana almost every day too. 28 lbs does seem like a lot but I guess that’s only about a 1/2 pound a week so when you say it that way, it doesn’t seem like too much. Yum! I love banana cake/bread. I mad a chocolate banana cake but used a 7 minute frosting. I think the cream cheese frosting you have here would have been even better. I eat bananas almost every day because they are the perfect pre-workout snack! My husband probably eats 2 a day… LOVE this cake, so pretty, too! Wow – that is beautiful! My nickname as a child was Anna Banana – because I was always eating them! I can’t wait to try this one! Yes! 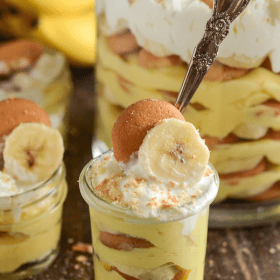 I will totally be making this the next time I find a bag of already ripe bananas on the reduced produce shelf! Thank you!!! I’m making this tonight. I have two bananas waiting for me. My two year old is obsessed with cake lately. This looks so moist and awesome. 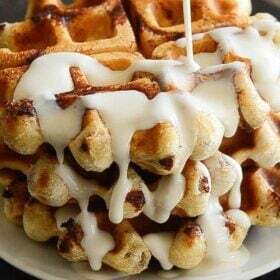 I like the addition of the cinnamon sprinkled on top too. 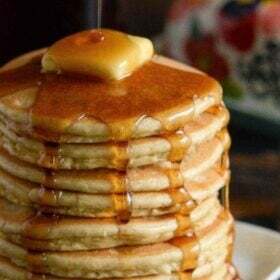 This looks heavenly. I am going to have to try this one! My family loves bananas! I love bananas, but I love this cake more! This looks amazing!! Too funny, I was searching your blog last night for some banana recipes because I had 3 over-ripe bananas! I ended up just going with a banana bread, but this would have been totally better!! Wow! Your cake looked good 2 years ago but, this layer cake is absolutely divine. Being a new blogger it is so inspiring to see the transformation of skills over the years. Love your blog! Oh yes. That is a triple layer cake with my favorite frosting on it. Oh how do I want it. Greatly. Oh my gawd….I want this cake right now! I was reading back then – I remember because I made this cake after you posted about it. And you’re right. It is flippin’ AMAZING. SO SO good. I am so grateful you posted it again because it reminds me to make it again while I’m still pregnant so I have an excuse to eat as much of it as I want! Hope you’re doing well, girl! Sorry it’s been so long since I’ve commented! Great photos! This cake looks delicious! Can’t wait to try it. Weighing the bananas I eat for a year to see how it compares to the average 28 pounds seems like a challenge! I think I just found the cake to make for a co-worker’s birthday at the end of the month! That’s some serious big fat banana cake! My husband is a obsessed with bananas and if we ever have banana crisis in the world – u can come arrest him. I’m going to throw those facts on him today and see how much he knows and act as if I knew them all! I love bananas and am forever trying to figure out ways to use up the few that never get eaten. I love banana bread, but I’m drooling over this cake. It’s on my list now! I can’t make a layer cake to save my life. Can this recipe be made in a 9×13 pan? I’ve got some very ripe bananas that have found their calling! This cake looks delicious!!! I have everything to make it except applesauce….is there anything you can substitute it with? I bet I eat way more than 28 pounds a year, haha 🙂 I know I’d love this cake – yum! Oooh wow. This cake has my name all over it. I am not a huge fruit in the raw person but I am trying to learn to like bananas. Love them in things but so far can only eat about a quarter of a plain banana without being freaked out by texture – blame my parents. Bread, muffins, cookies and this cake… oh this cake, yeah, I’ve got to try this. (specially since I have the rest of all of those bananas I’ve been trying to eat in the freezer). Thanks for the banana education! 🙂 I LOOOOOVE banana cake w/ cream cheese icing! yours looks awesome. I love fun little facts like that. If this is your favorite cake, then I have got to make it. I have a favorite banana cake recipe too, but I would like to see how it compares to yours!! What interesting facts about bananas! This cake is beautiful and sounds delicious! Great post and drool worthy pics! That banana cake is no joke and I totally want a huge slice! This cake does look oh-so-dreamy! I love bananas and would love this cake for sure!! I love bananas! At one point I was eating so many that at an annual check-up my my blood work came back with potassium levels a little high and I had to lay off them for a bit. True story! Your cake sounds and looks delicious! What a gorgeous cake, very moist, very morish – changed the filling though, didn’t really fancy cream cheese so made a family favourite of traditional buttercream with added double cream and a teaspoon of maple syrup, gives it a slightly walnutty taste and a much softer texture. hi just wanted to let you know that I made this for my sons 12th birthday today(8/13/11) 🙂 He loves monkeys so what better cake to make him than a banana cake? He loved it and after eating his sliced asked me to please make this his permanate birthday cake 😀 the only thing I changed is that I put the cream cheese frosting between the layers and crumb coated it with it then finshed it off with butter cream. Love this cake and will be making again and again and again and again. Made this for my husband’s bitrhday. Was nervous about not having super ripe bananas and needing to bake it for more like 65 minutes BUT not to worry. Turned out beautifully! Incredibly moist cake and delicious frosting! I will most definitely be be serving this again! Thank you!! Pingback: The Novice Chef » I ♥ SPRINKLES! I made this cake for a dinner party this weekend and it was phenomenal. How the heck did you get it assembled and iced though? I couldn’t get the cream cheese frosting thick enough to hold against the density of the three heavy layers. I even used 1.5 kilograms of sugar, which I think is around 15 cups. I did a crumb coat as well and even used skewers as makeshift dowels (the babe was napping and I couldn’t get out to buy real ones). I couldn’t get it to stop leaning to one side. It was delicious nonetheless and we dubbed it the delicious banana ugly cake. How strange! I had no problems putting this one together into a layer cake and it even stayed put for a drive to Jorge’s office! I make the cakes, pop them in the freezer, make the icing, pop it in the fridge for a few minutes while I get out the cake layers. Get the cake ready to go and then put it together with a crumb coat, back in the fridge for a few…then final layer. I made it just a week ago and on issues again. Banana Cake is my all-time favorite! 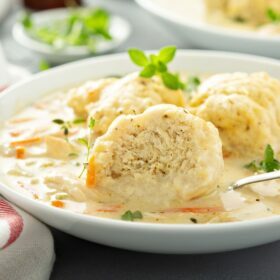 I’ve made the original recipe from AllRecipes.com and absolutely loved it, but I can imagine the addition of applesauce and sour cream does wonders! Can’t wait to make this version!! JUST made this cake and I’m DYING to try it tomorrow for my hubs birthday. I tried some crumbs with frosting and it’s already divine. He’s a huge banana cake fan and he’s really looking forward to it. Sprinkled cinnamon on the top… mmmmm! Cooking time was a little longer… took it out at 60 mins but probably could have used a couple more. Eek! It’s one of my favorites! How was it when you finally got to try a bite?! And I think you were probably ok! I always feel like it could bake a little more…but really it is done! The cake is just incredibly moist! it was AMAZING! So delicious!! Hubs has asked for it to be his birthday cake every year! I loved this recipe so much that I want to make these into cupcakes for my son’s birthday but am concerned about converting the cooking time. I would normally test cupcakes after about 18 minutes on 350, but because this recipe bakes at 275 and the 8 inch layers bake for much longer than a traditional layer cake, I’m not sure that would be enough. Have you made cupcakes out of these before? Any idea how long to bake them for. I have never made them into cupcakes, but I think it is a brilliant idea! I would actually probably bake one cupcake at a time and see what happens. I would probably actually start with baking it for about 16 minutes, and then popping it into the freezer, and then cutting into and see if it needed a longer baking time. hmm – left a comment, but not sure if it posted. The cupcakes are great. I baked them for 22-25 minutes at 300 – 275 was just too slow. I didn’t pop them in the freezer either, but they didn’t need it. I filled them 2/3 full and the recipe made 3 dozen perfectly sized just to the top of the paper cupcakes. I just made this and it is AWESOME! Thank you for sharing your recipe! Can I do without the sour cream or can I sub it with something else? This looks delicious but I had a bad sour cream experience that I just can’t shake lol. I promise you can’t taste the sour cream AT ALL! But if it has to be substituted, I think you could probably get away with some plain greek yogurt. Awesome! I gogled banana dream cake and you were the first result! I will be trying this tonight, except with chocolate/peanut butter buttercream icing. Made this yesterdat and it came out awesome. Used a homemade chocolate buttercream frosting. Thanks for posting this! I can’t imagine this with anything other than the cream cheese frosting…but I am so excited to know it is awesome with chocolate buttercream too! Mmmm, I am going to make that tonight!!! Thanks for sharing the recipe! I wanted to tell you that I made this cake on Monday and it was DIVINE! I choose to make this cake because I wanted to use some jam (Monkey Butter=Banana, pineapple and coconut jam) to put between the layers. It came out prefect, I think freezing it really helps the entire process as well. Since I used your recipe on my blog I made sure to link back to your page and give you the credit:-) Hope that is okay, and thank you! I made this cake in cupcake form for my son’s first birthday and they were a huge hit!!! EVERYONE thought the cupcakes were delicious and my son ate it up! He loves banana =) I will definitely be making this banana cake again in the future. Thank you soo much! I really want to make this cake for Easter! I have two 9in cake pans, do you think that would work if I made it into just a two-layer cake? And I’d probably bake it for a few minutes less, correct? I hope you can help me! Thanks! If you bake it in two 9inch pans, you will need to increase the time. While you are adding an extra inch to the cakes, you are also doubling the batter in them. I used 3, 8inch pans to make a 3 layer cake. If you do two layers, in 9inch cake pans, I would increase the time by about 8-10 minutes probably! Good luck!! 🙂 And Happy Easter!! Just made your cake. Before serving to a houseful of guest, I wanted to make sure that this cake is a bit dense. I greased and floured the pans well before baking, but the cakes were very hard to get out. Took much longer to bake than expected, Hoping its not underdone. Do your cakes turn out dense or light and airy?? How many cupcakes would this recipe make? Could I just use it as is for cupcakes, or how could I adjust it? I have never made this as cupcakes, only as a layered cake. However many readers have made it as cupcakes with no issues, just keep your eye on them as the bake and pull them out on time. Seeing as I haven’t made them as cupcakes, I can’t guarantee this…but another commenter above said it made 3 dozen cupcakes for her. I LOVE this cake and have made it atleast 5 times.. I want to make it for a party and need to change to make mini cupcakes. Do you tknow if it Will come out ok? Should I change recipe? I have had many other commenters say they made these as cupcakes and they turned out great. So I think you should just make it as normal, just in cupcake form! 😉 Good luck! Sorry I wasn’t able to reply right away! The crumb layer is a really thin layer of frosting around the outside of the cake. So put together your cake (with regular thick layers in the center) and then do a thin layer of frosting around the outside. Let the frosting harden a bit (pop it in the fridge if needed) and then put on the rest of the frosting. Hope this answers your question!! My Grandma’s 60th birthday party is this saturday and although we already ordered her cake, I plan to make this, in cupcake form, for after party coffee.. I have a few days to try it out but im sure its gonna be ahh-mazing! This cake looks divine. 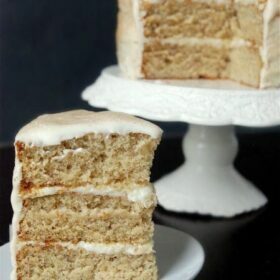 I make a Bananas Foster cake-mix extender cake that is my most popular flavor by FAR, but am looking for a scratch base. Wondering why the oven temp is so low? Thank you for this recipe! I was in charge of dessert for this year’s Thanksgiving – and although the pumpkin pie was great I new that shaking it up and bringing a non-traditional dessert could be a hit. So your Banana Dream Cake was the chosen one – and it didn’t disappoint. 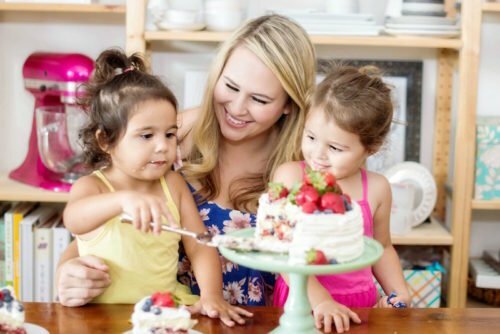 I have a family full of “foodies” and gourmet home cooks – and this cake was absolutely loved by all. I still have one pumpkin pie left – but the banana cake was devoured. I came across this recipe of your and was planning to try it for my birthday, my only concern was won’t putting a hot baking pan plus cake in the freezer damage the freezer? or are we supposed to turn it out and then put it in the freezer? Nope, you leave it in the cake pan and pop it directly into the freezer. Because it is being baked at such a low temperature, I have never had any issues doing it. I set it on the wire racks in my freezer with no issues. If you are worried about placing it directly on your freezer, put a plate in between! I made this cake as cupcakes tonight…and they are delicious!!! I make banana cake frequently throughout the year for family birthdays (its either banana or chocolate cake in our house). I have made maybe 5 different recipes over the years and this one has just become my go to! Thanks for posting it (again)! I’m so happy to hear it Deese! Hi! I have to ask! 4oz applesauce equals 1/2 cup? Thnks!!! I made the cake yesterday, my family LOVE IT!!! probably for our taste the frosting is a little bit too sweet, buy the cake!! OMG!! its amazing!!! thnks for shearing your recipes!! 😀 we really love the babana nutella cupcakes, and now this cake!!! Greetings from Mexico 😀 THNKS AGAIN!!! 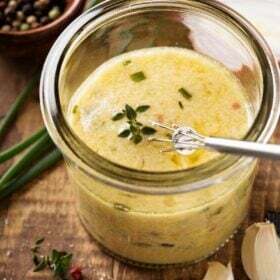 Hi – I love knowing how food works – I looked at the orignal recipe and comments and the recipe you made two years ago and this one. The main difference is the addition of the applesauce. What changes did it invoke in the cake? What makes this recipe better than the original in your opinion? And did you ever experiment with the cooking time and temp as that is the main controversy on the original recipe? When you say overripe bananas, do you mean black bananas. Yup! Or bananas that have black spots on them! This banana cake is the best cake I have ever tasted in my entire life. I would have it every day. I received so many compliments on it. Thank you thank you! If you come up with a chocolate cake recipe as moist as this banana cake is PLEASE pass it on! Haha! I’m so glad you like it!! can you explain what a crumb coat is? The crumb coat is a really thin layer of frosting around the outside of the cake – before you put on the final frosting coat. So put together your cake (with regular thick layers in the center of each layer) and then do a thin layer of frosting around the outside. Let the frosting harden a bit (pop it in the fridge to harden it up fast) and then put on the rest of the frosting. They call it a crumb layer because it keeps crumbs from breaking off and winding up in your frosting. So I have wanted to comment on your blog for a long time, but I never knew what recipe to comment on…needless to say, I chose this one, which probably isn’t so smart on my part since this is essentially the most commented and used recipe of yours EVER. But, I am going to make it in about 2 secs so I decided I would comment here anyways. Just to say that 1. You are my favourite food blogger, EVER! And I hope you take that to heart, because I have read a lot of food blogs in my time (an unhealthy obsession of mine). You have a really relate-able sense of humor, great photos and recipes, and just a great blog in general. 🙂 2. I’m comparing this cake to another recipe, so I’ll tell you the results soon…(not that you will even see this comment) thanks so much for blogging! I eat bananas with my spaghetti too, but like them even better with lasagna. (My children and hubby give me weird looks. I feel sorry for them, they don’t know what they are missing! haha) I learned to do this from my Puerto Rican dad. As a kid we’d eat bananas with every meal. LOL Your hubby must be Hispanic? Can’t wait to try this cake! Baked this today, it is delicious. Well, I made this cake for my son’s birthday yesterday and it was very very good! Moist and delicious! I used another frosting and I as a filling I use caramel, very yummi! Just baked these, and they look and smell great! The 50 min cook time was accurate for me; the only change I made was adding an additional 1/4-1/2 cup of banana because the batter didn’t taste banana-y enough to me. 🙂 I found these cakes more difficult than usual to get out of the pans, so a word to the wise: make sure you grease and flour VERY generously. I was able to get each layer out in one piece but I not only had to run a serrated knife around the edge, I also had to use my fingertips and gently pry out each cake while holding the pan upside down at an angle before the layers would slowly drop out into my waiting hand. Very nerve wracking, but it worked! I am eating this wonderful Banana Dream cake right now as I am typing this…it is the best cake ever! I am a true chocoholic and I must say this is better than any other cake I have ever tried. It is just fantastic. I must give a big thanks to my niece Nicole for making this for me to celebrate my birthday today. And thanks to you Jessica for posting this great recipe. Pingback: Banana Dream (Sometimes I make Stuff: Vol. 5) | He Cooks. I Eat. We're Happy. I used wood real thin tall tooth picks to keep the layer cake togather….very moist cake yyummy….. Literally the best cake I’ve ever had! Made it for my parents’ birthdays and wasn’t sure how they’d feel about banana but everyone was practically fighting over it. Super moist and soft and just the right amount of banana flavor. I used mini chocolate chips around the outside of the top of the cake for decoration-because I love chocolate and banana-and it was delish. Thank you! Can’t wait to try pumpkin dream cake next! Any chance I can substitute the all purpose flour with a gluten free mixed flour blend? Have you or anyone else tried it? I made this cake and while the taste was great, they were super dense. Is the cooking temp of 275 correct? This is the second “dream cake” of yours I’ve made. The first one I tried was your pumpkin dream cake and it was so awesome I wanted to try this for my dads birthday this year. In the past, my mom had always made him a banana cake that was a family favorite so I had a lot of pressure to produce a cake just as good! Well, it succeeded! Everyone at the party devoured their piece and my mom even declared it better than her banana cake. I can’t wait to try your other “dream cakes”, thanks for another winner. P.S make sure you grease your pans extra good! The cake can be a bit hard to remove otherwise! The cake is perfect! 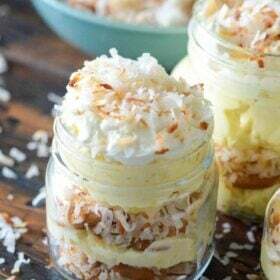 I was wondering if I could leave out the bananas in order to get vanilla cake just as perfect? I have tried it and it still needs something else. You could always try using applesauce in place of the bananas for a milder flavor. i made this last week and then made the Pumpkin Dream Cake as soon as it was devoured by my family. Absolutely divine! Can’t decide which I like better. Thank you for these “dreamy” recipe’s! So glad to hear that! Thanks for coming back and commenting! Just made this Banana Dream Cake- earlier – yummy!! Like me, the boys [hubby and son] absolutely loves it.Thanks for this lovely recipe, it’s difference from the other banana cakes I’ve been making!.I don’t have the 8″ pans so I used 2 x 9″ instead, just two layers but it turned out okay and yummy! !..I’ll be baking more of your cakes…Pumpkin Cake is next! So glad you liked it Lin! Thank you for sharing what sized pans you made and how it worked for you! Thanks for taking your time to message me, I just have made the second lot of Banana Dream Cake, my son said, not to use any more Banana Cake recipe, this has to be the one! I agree! I like to send you a photo of my masterpiece he!he! do you have an email address? I made this cake on vacation and at 9000 feet (lots of high altitude adjustments!) and was probably the best cake I’ve ever made. It was so moist, tasty, and perfect! Next up is the pumpkin one and I can’t wait! I plan on making this cake tonight for a birthday party and plan on covering it with fondant. I am making and using a butter cream frosting, since cream cheese icing affects the fondant. Do you think it can stand or take the weight? Hi! Yes, it is a heavy enough cake to stand up to frosting! Question. I know for your pumpkin dream cake you made it as cupcakes as well. Have you done it with this recipe? I am thinking about doing the pumpkin and banana as mini cupcakes. Wanted to make sure if I don’t need to alter the recipe. I have made these as cupcakes many times and they turn out great. I hope you enjoy them!! It looks like a good cake…. But… I can’t believe you ripped off the name. In the 1960’s through the 1980’s, Langendorf Bakery in Northern California made Banana Dreams. They were wonderful !!! Two cakes to a package, a spice cake the shape of strawberry shortcakes filled with a rich banana filling. These cakes were legendary and put all Hostess to shame. Now, find a recipe for these and you really have something great! 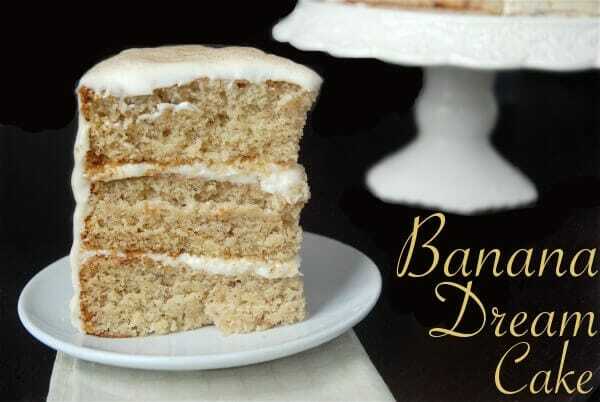 But… Until then make this cake and and dream that it was half as good as the original Banana Dreams…. I have never heard of Langendorf Bakery in Northern California and I wasn’t even born until the late 80’s. So no, I don’t believe I ripped off the name. Thanks for sharing your opinion though! Would this be enough to make two 13 x 9 cakes? I am making this for my son but I don’t have the 8 inch pans, only the 13 x 9. It would make one 9×13, but not two! Hi Natalie! I have a standard wall oven from GE. I put two towards the back (one on the left and one on the right) and one towards the front/center. My oven thankfully bakes pretty evenly! Hi! So when do you remove the cake from pans? After you freeze? Do they have to thaw before you remove them?